Flower Girls are precious. The last wedding I attended, she was throwing the flower peddles just as high as she could with a big smile on her face. Everybody felt the enthusism she had being the flower girl. 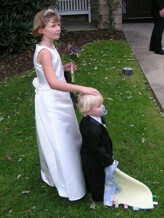 You will want to give your flower girl a special gift. 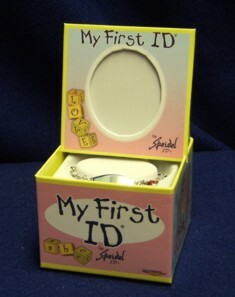 We carry Speidel's My First ID bracelets. They are just precious and your flower girl have a great time showing off her very own First ID Bracelet. Choose from different styles of bracelets to fit your flower girls personality: Butterfly, Lady Bug, Cross or a Teddy Bear Bracelet. We engrave her first name on the front and wedding date on the back at no additional charge.